Biography of Russian Impressionist Landscape Painter. (1892) Tretyakov Gallery. By Levitan. Among the greatest modern paintings. 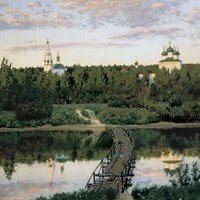 One of the best landscape artists among the progressive group of 19th century Russian artists known as the Itinerants (Wanderers), Isaac Levitan's main contribution to Russian art was his development of the "atmospheric landscape", achieved through his supreme mastery of colour, light and shade. Although the depiction of light was crucial to his compositions, as it was to those of Monet and Sisley, Levitan was a realist rather than an Impressionist. Devoted to naturalism and plein air painting, he had a gift for portraying all the seasons of the year, different times of the day and an infinite variety of natural views. Famous examples of his landscape painting include works like Secluded Monastery (1890, Tretyakov Gallery, Moscow), and Vladimirka (The Road to Vladimir) (1892, Tretyakov), as well as evocative works like Golden Autumn (1895, Tretyakov), Spring Flood (1897, Tretyakov), and Birch Grove (1889, Tretyakov), all bought by Pavel Tretyakov. Levitan was an active participant in artistic life; he gave lessons at the Moscow School of Painting, where he himself had trained, was actively involved the Moscow Club of Literature and Art, and exhibited regularly with such associations as the World of Art and the Munich Secession (1892). Now ranked among the top modern artists within the landscape genre, Levitan is considered to be one of the most influential figures in Russian Painting of the 19th-Century. Levitan came from a poor but educated Jewish family. In 1870, the family moved to Moscow, where Isaac attended classes at the Moscow School of Painting and Sculpture from 1873 until 1883. During this period both his parents died, leaving him poverty stricken, and dependent on friends and extended relatives for shelter. Fortunately, his artistic talent was obvious, and thanks to a timely scholarship and supportive instructors like Alexei Savrasov (18301897) - a mild-mannered, patient teacher who headed the landscape department at the Moscow School, whose other pupils included the Impressionist Konstantin Korovin (1861-1939) and the symbolist Mikhail Nesterov (1862-1942) - and his successor Vasily Polenov (1844-1927), an enthusiastic advocate of plein-airism, Levitan rapidly began to shine. Other important influences on his style of fine art painting ncluded the Russian teacher Vasily Perov (18341882), the works of the French painters of the Barbizon school of landscape painting, and those of the poetic classical realist Camille Corot (1796-1875). In 1877, Levitan had his first exhibition, receiving favourable recognition from the critics. In 1880 the eminent art collector Pavel Mikhailovich Tretyakov (1832-98) bought the first of many works by Levitan, Autumn day, Sokolniki - a soulful depiction of a grey autumn day in a Moscow park. It was around this time that Levitan also attracted the attention and support of the other great Russian arts patron Savva Mamontov (1841-1918), and began his lifelong friendship with the dramatist Anton Chekhov, whose brother Nikolai had been a fellow art student. He went on to work with both Chekhov brothers on the magazine "Moscow" and illustrated the M. Fabritsius edition "Kremlin". Later, along with Konstantin Korovin, he painted theatrical sets for performances of Mamontov's private opera. Meanwhile during the late 1880s, Levitan joined artists including Ilya Repin (1844-1930), Ivan Kramskoy (1837-87), Vasily Surikov (1848-1916), Vasily Perov and others, in helping to organize The Association of Travelling Art Exhibitions (aka The Wanderers, or Itinerants) in events across the country. He spent several summers painting at Plyos, a small town next to the Volga. Later, during the early 1890s, he divided his time between the towns of Vyshny Volochek, Vladimir, and the Tver region. 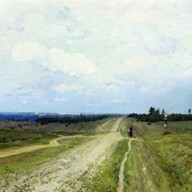 Levitan rarely if ever painted urban scenery, preferring instead more rural views of woodland and meadow. It was in these situations that Levitan's intuitive appreciation of nature could best be expressed - witness the profound understanding of light, linear perspective, and sympathetic colours in paintings like Secluded Monastery, Road to Vladimir and Golden Autumn respectively. 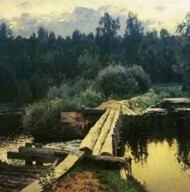 Nor was Levitan averse to the introduction of symbolism into his compositions: notice for instance the single rickety bridge "connecting" the monastery to the outside world, or the wide straight track to Vladimir, the same track along which convicts were marched to Czarist prison camps in Siberia. Despite this occasional narrative, Levitan was first and foremost a naturalist and "mood landscape painter" in the tradition of Corot. He never looked for complicated subjects but was quite happy with simple scenes typical of his native land. But he retained an extraordinary ability to awaken deep human feelings through his landscapes. See also: Best Impressionist Paintings. During the 1890s, Levitan's reputation spread throughout Europe. In 1897, he was elected a member of the Imperial Academy of Arts, and in 1898 he was appointed head of the Landscape department. Sadly, he was already suffering from the serious heart disease that would soon take his life. Despite this, he carried on painting to the end: producing a number of peaceful twilights, moonlit nights, and tranquil villages. He spent his final 12 months at Chekhovs home in the Crimea. On his death, he was interred at the Jewish cemetery at Dorogomilovo. Later, in 1941, his remains were moved to the Novodevichy Cemetery. He never married. Building on earlier Russian painting of the 18th century, Isaac Levitan left more than a thousand oil paintings, watercolours, and other works on paper, many of which can be seen in the best art museums in Russia.  For more biographies of Russian landscape artists, see: Famous Painters.  For more information about Russian painting, see: Homepage.